What have records both vinyl and shellac got in common with this illustration? It illustrates the useful frequency range of a piezoelectric material. The type of pick up cartridge commonly used to play records was based on a crystal called Rochelle salt which is piezoelectric. They were called crystal cartridges. They had a linear frequency response in their “usable region”. They were quite useful at the introduction of the electric phonograph because they could play acoustic records. They had a couple of problems though, 1: not much bass output; and 2: a rising treble. The rising treble “peak” could be controlled by a capacitor load (I’ve seen 600pf used), but the response still rose a little. 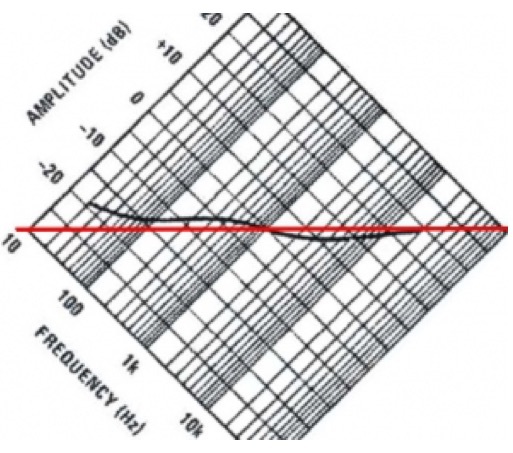 When making electric records (as opposed to acoustic) a considerable amount of “EQ” (equalisation) to the cutter-head was required to give a flat frequency response. In-fact, being constant velocity (after applying feedback coils that is), the cutter head had a falling response which had to be “tweaked-up” to make it cut “flat”. The demands on the driver amplifier in trying to achieve this were considerable, but observing that the (crystal) replay cartridge gave need for some bass boost and shelving down of treble, the driver EQ could be advantageously made to track the inverse of the average (crystal) cartridge response. I say advantageously because it reduced the dynamic range demands on the driver amp. Therefore the first of many different EQ curves was born. As record playing equipment was often made by the record manufacturers, the recording EQ was geared to the playback equipment – in this case the ability of the crystal cartridge. The list of EQ curves is as long as your arm, but let’s jump to 1953, and the new orthophonic standard or “RIAA curve” was agreed by the Recording Industry Association of America, and the resultant graphical plot is shown below. OK, I cheated – I took the curve most people consider to be the RIAA replay curve and rotated in 45 degrees. The thing just about everybody never takes into consideration is the contribution from today’s magnetic cartridges. The plot above if represented in its original (-45 degrees from where it is now) form is the record’s output PLUS the magnetic cartridge response. The above response is that of the record only – the red line represents “flat” response. Now go back and take a look at the first image. 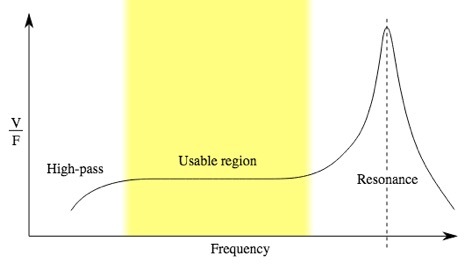 If you imagine the resonant peak, or spike, having been flattened somewhat by the loading capacitor (see paragraph 2) then the above curve is a close inverse-match! It’s got bass boost to make up for the bass loss – and it’s got treble cut to make up for the (compensated) rising treble. So the purpose of record equalisation is what? Correct: to make the output from a crystal cartridge have a reasonably flat response … and by sheer luck, at the same time it helped solve the dynamic range problems of the cutter head driver amplifier.